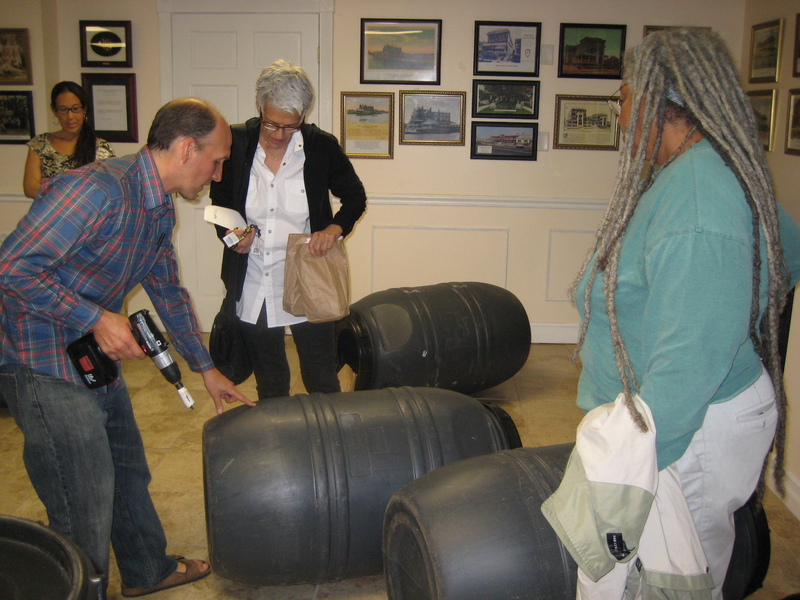 On June, 7, 2012 The Jersey Shore Chapter hosted its second ever build-a-rain-barrel workshop in the coastal town of Bradley Beach, NJ. Over 30 enthusiastic people turned out to the senior center and built 42 rain barrels! This surpassed the awesome turnout at the first workshop in Brielle last fall. Way to go Bradley Beach! 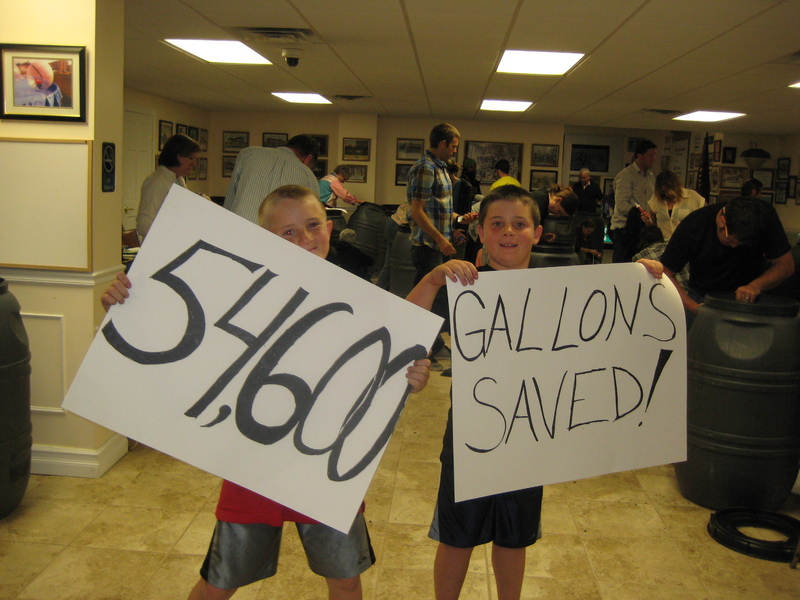 Each rain barrel can capture 1,300 gallons of rainwater in a year. So we are helping to prevent 54,600 gallons of stormwater from polluting our oceans, lakes, and streams each year! Water captured by a rain barrel can be used for non-potable uses, including watering lawns or gardens, rinsing off sandy feet after the beach, or other uses like washing the dog. Workshop participants built their very own rain barrels to take home that night, and learned about what else they can do to protect the water quality of our ocean and waterways. The Jersey Shore Chapter partnered with the Bradley Beach Environmental Commission to host the workshop. Sara Mellor from the Water Resources Program at the Rutgers University Cooperative Extension presented on the water quality issues impacting New Jersey. She also talked about how water conservation, pollution source controls, planting rain gardens, and installing rain barrels can all be solutions. Rutgers then lead the group in transforming 55-gallon used olive barrels into rain barrels. All it took was drilling two holes, one for the spigot and one for the overflow, a little bit (or a lot) of caulk, some screen to keep out the mosquitoes, and some elbow grease to screw on the top. Everyone went home a proud owner of a rain barrel with the knowledge of how to properly install and maintain it. Since the barrels can be easily painted, many participants had the aspirations of turning them into works of art to compliment their landscapes. The chapter is embarking on a mission to develop an Ocean Friendly Garden Program tailored for the East Coast with help from our West Coast Surfrider colleagues and East Coast water quality and landscape experts. Future events (including more workshops in the fall) are being planned by the Jersey Shore Chapter to promote Ocean Friendly Gardens in our local communities. Stay tuned to the chapter website for updates. We are looking for volunteers to help us out, as well as any ideas for community projects. So far we’ve had a great start! For more information about stormwater, rain gardens, and rain barrels in New Jersey, please see www.water.rutgers.edu. Think your community would like to host a workshop? Please contact us with Rain Barrel in the subject line. More photos from the event are at the Jersey Shore Chapter’s facebook page, and by clicking here.